How do we calculate CPU and Platform value? OK humble readers, it's time to crack out those calculators and pop on those math hats because we've got some sums to work out. Well, in truth, you don't - that's our task - but we'll walk you through how we've calculated the value of CPUs and platforms we've tested with to see what's the best bang for buck punt for your pound! Many have said the Core i7 platform is too expensive to warrant an upgrade, but by putting a number to the performance increases we hope to try and ascertain if this extra cost is justified. = ( ( Performance Score "X" / Base Performance Score ) * 100 ) - 100. We work this out by calculating the positive percentage difference between the lowest performing part, compared to everything above it. This way we have a base reference performance and a percentage for everything above it, regardless of whether it's MB/s, frames per second or time. By attaining a uniform factor this allows us to work out part three below. For example if the baseline CPU runs at 100MB/s and another runs at 150MB/s, the percentage difference is +50 percent. It's the same as saying if the baseline CPU runs at 30FPS and another runs at 45FPS, the percentage difference is still +50 percent. = ( ( Base CPU/Platform Performance Price / Performance CPU/Platform Price X ) * 100 ) - 100. Here we access the relative percentage difference in price for the CPU or platform of interest, compared to the base performance CPU or platform cost. This factor is mostly negative because as the CPUs perform better, they also cost more. For example, if the baseline CPU price is $100, but the faster CPU is $200, that's -50 percent. However if the baseline CPU costs $400 but the faster CPU costs only $100 (an overclocked CPU for example), then it's 300 percent better, relatively speaking. By knowing both these we have our two main factors for comparison. Adding both of these together gives us the relative performance percentage difference in relation to the relative cost of either the CPU or the whole platform. We have also averaged every number to get an "overall" relative percentage, to get broad idea of relative performance across the entire set of tests - file and image compression, gaming, transcoding, PCMark and scene rendering. We've included overclocked numbers for the Core i7 920 at 4GHz, as well as the very popular Core 2 Duo E8400 at 4GHz, Core 2 Quad Q6600 at 3.2GHz and on the AMD front the Phenom X4 9850 (or 9950 - they are the same price) X4 Black Edition at 3GHz. Including the variables in the total platform cost, we can ascertain how much the total platform performance affects the end result - after all, while AMD Phenom X4 CPU performance is usually lower than Intel, the CPU's, motherboards and DDR2 memory will cost a fraction of a Core i7 motherboard, CPU and triple-channel DDR3 memory. Can the price difference offset the performance advantage? The prices we've included are the official list prices in US Dollars for October 2008 from the Intel and AMD websites. 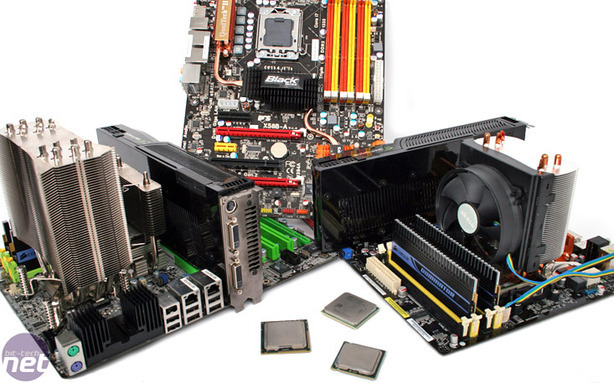 The other equipment - motherboards and memory were sourced from reputable online resellers who had stock at the time of writing. Despite wanting to work in Sterling, we decided to keep all the prices are in US Dollars in order to set a uniform base and because the USD:GBP exchange rates are far from stable.